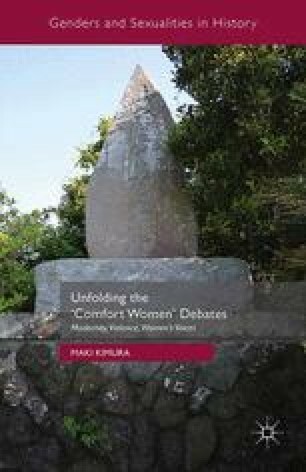 The testimonies of ‘comfort women’ victims, as examined in the previous chapter, have played a key role in re-examining how history is understood and written, and have been vital in the debate surrounding the ‘comfort women’ system. Feminists, in particular, have argued that the victims’ testimonies have uncovered women’s experience in history, which had been ignored or under-represented in official documents. Ahn also points out that victim-survivors tend to be more at ease with the oral mode of communication, as many of them have been near illiterate (Ahn, 1999: 60–2). As discussed, while it is essential to examine and rewrite history from a gendered perspective, probing historical ‘facts’/‘truth’ and claiming that the testimonies of ‘comfort women’ victims can reveal them has raised many problems. We need, therefore, other ways to engage with and listen to these women’s narratives. This chapter will examine how feminism has been engaging with women’s narratives and how such discussion would offer the possibility of understanding testimonies beyond the discussion of historical ‘facts’/‘truth’.